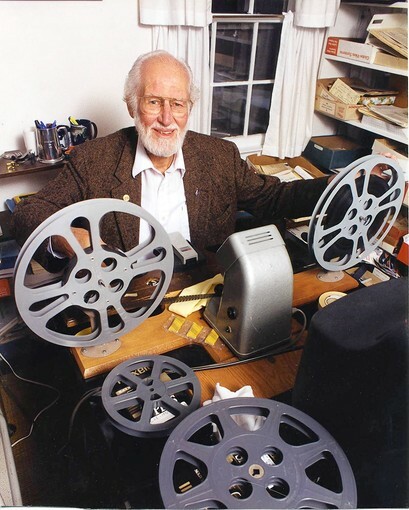 In his December 26 New York Times column, Frank Rich calls our attention to a fascinating “home movie documentary” called Disneyland Dream. Shot by a Connecticut man named Robbins Barstow, a diligent amateur documentarian who apparently made numerous films about his family’s life and activities, this particular work was named to the Library of Congress’s National Film Registry two years ago, one of only a handful of amateur films to be so honoured. 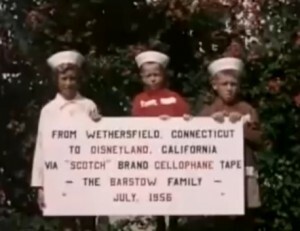 Disneyland Dream is a half-hour account of how the Barstow family entered a 3M Scotch Tape promotional contest in 1956 and, thanks to their 4-year-old son Dan’s entry, they won a week-long vacation at the year-old Disneyland in Annaheim. This is not the random, formless collection of footage which makes up a lot of home movies (and now even more gruelling home videos), but an artfully constructed narrative using occasionally comical restagings and various camera effects, such as slow motion and reverse action, to evoke the entire family’s excitement and pleasure in being the recipients of such an honour. There’s obviously a very strong element of nostalgia in watching the film now – the depiction of air travel before jets and oppressive security, the surprising simplicity of the theme park’s attractions compared to the elaborate computerized distractions we’re surrounded with now. But what seems most interesting is that Barstow’s wonder at the things he saw and experienced is also tinged with nostalgia, a sense that he was seeing signs of glories already past: the opulent hotel the family stayed at was representative of a more elegant and privileged time, Disneyland itself was steeped in a recreation of a “mythical” bygone America. Perhaps the one thing that separates the world we glimpse in Disneyland Dream most sharply from the world we live in now, however, is the fact that Barstow’s depiction of it is completely irony-free. And perhaps that’s the biggest source of the feeling of nostalgia the movie evokes. There are more than a dozen of Barstow’s movies available on the Internet Archive. This entry was posted in Commentary and tagged Amateur Film, Disney, Documentary, Review. Bookmark the permalink.